The London Gazette is said to be Britain’s oldest continuously-published newspaper. It was founded in 1665 and has ever since been a record of official announcements. It is not a conventional newspaper, however, being instead a highly specialised resource used by policy-makers, the legal profession and historians. It is an official newspaper of record and is a government publication, published by The Stationery Office . It groups the information it holds into the following categories: State, Parliament, Ecclesiastical, Public Finance, Transport, Planning, Health, Environment, Water, Agriculture & Fisheries, Energy, Post & Telecom, Competition, Corporate Insolvency, Personal Insolvency, Companies & Financial Regulations, Partnerships, Societies Regulation, Personal Legal. For the silent film researcher, the London Gazette is an unexpected treasure trove. The journal has supplied official reports on all company insolvenices, and browsing through its archives brings up hundreds of records of film and cinema industry companies that went bust. It makes for sad but very revealing reading. And the great thing is that the Gazette‘s archives have been digitised and are fully word-searchable. Searching is by the search box found on the website front page. An advanced search option allows you to narrow searches by date, phrase, page number and by some selected historical events. Narrowing down the date fields to 1895-1929 brings up 1,832 results under the word ‘cinema’, 765 under ‘cinematograph’, 1,455 under ‘film’, and 87 under ‘bioscope’. So there is plenty to be found. Each record leads you to a PDF copy of the relevant page, from which it is then possible to browse acros the rest of the issue. Each record supplies you with date, issue number and page number, and search results can be sorted by relevance, oldest or newest date. The texts are fully word-searchable, and though the OCR is uncorrected it is of a good standard. 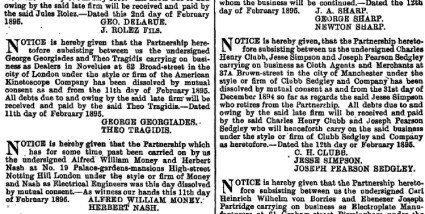 NOTICE is hereby given that the Partnership heretofore subsisting between us the undersigned George Georgiades and Theo Tragidis carrying on business as Dealers in Novelties at 62 Broad-street in the city of London under the style or firm of the American Kinetoscope Company has been dissolved by mutual consent as and from the llth day of February 1895. All debts due to and owing by the said late firm will be received and paid by the said Theo Tragidis.— Dated llth day of February 1895. This mysterious duo played an important part in British film history, being the customers who asked Robert Paul late in 1894 to manufacture Kinetoscopes for their Edison 35mm films, after which Paul decided it would be worthwile breaking into this business himself, so starting up the British film industry. The Companies Acts, 1908 and 1913. 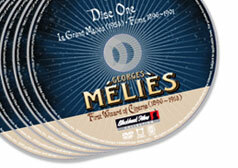 Special Resolutions of the GLOBE FILM CO.Limited. Passed the 28th day of July, 1916. Confirmed the 14th day of August, 1916. ” (1) That it is desirable to reconstruct the Company, and accordingly that the Company be wound up voluntarily; and that Henry McLellan, of 6A, Devonshire-square, in the city of London, Chartered Accountant, be and he is hereby appointed Liquidator for the purpose of such winding-up. ” (2) That the said Liquidator be and he is hereby authorized to consent to the registration of a new Company, to be named ‘Globe Films Limited,’ with a memorandum and articles of association which have already been prepared with the privity and approval of the directors of this Company. There is a lot of this, sometimes formal reports, sometimes simple lists of titles of companies that are being wound-up. There are also bankruptcy notices for individuals in the film trade (such as Mollie Hanbury, film actress, reported 29 August 1922), and official notices of legislation and regulations relating to films, such as the Cinematograph Act of 1909 (as reported in the Gazette of 21 December 1909) or prescription on the amount of celluloid one could have in a building under the Defence of the Realm Act (reported 13 October 1914). If you are looking for human interest, you will have to read between the lines. These are dry accounts of official transactions, which give you names, dates, occupations and locations, and little more. But you do seen the motion picture business as a business, and not as usually portrayed. Rather than a world of artistic endeavour and happy entertainment, here we see year after year of failures, as so many tried to join in the boom and failed. A close analysis of the reports in the London Gazette would be interesting for what it might illustrate of the ebbs and flows of a new business trying to put down roots. Much of that business is in the exhibition rather than the production side (so many failed cinemas), but that is an accurate reflection of where the balance of the money lay. The records are not unique, and you can find much the same information on bankruptcies and windings-up in the Board of Trade records at The National Archives (as described in an earlier post). But it’s a side of film history that is too often overlooked, a side which must bring a healthy dash of realism to our understanding of what the early film business was. It was paved with broken dreams – and here’s the evidence. Useful information on film companies formed and dissolved can also be found in Parliamentary Papers, which list various different types of companies though without the detail of The London Gazette. I came across the following list of Yorkshire companies by accident, but just reading through it you can start to get an impression of the turnover of picture house companies (along with skating rinks and other amusements). The list is at http://archiver.rootsweb.ancestry.com/th/read/YORKSGEN/2000-11/0975652879. Another area The London Gazette may prove useful, is if personalities served in the forces, particularly as Officer material; promotions, decorations, mentions in despatches may mean that they would be Gazetted, and it is a way of keeping tabs on their military careers. As an example, http://www.london-gazette.co.uk/issues/30839/supplements/9444 Lt. P. St.J. B. Rathbone of The Liverpool Regiment mentioned within would be better known as Basil….